Doi Suthep in Chiang Mai is the most important temple in northern Thailand. This blog is a slideshow of images I took when visiting in January 2015. 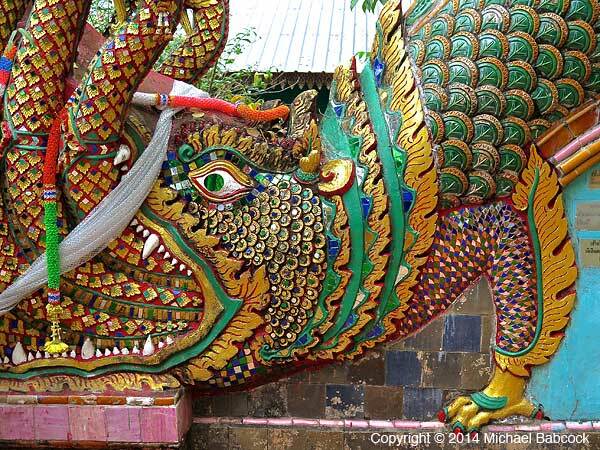 Temples in Thailand can consist of many buildings inside a compound (the wat). 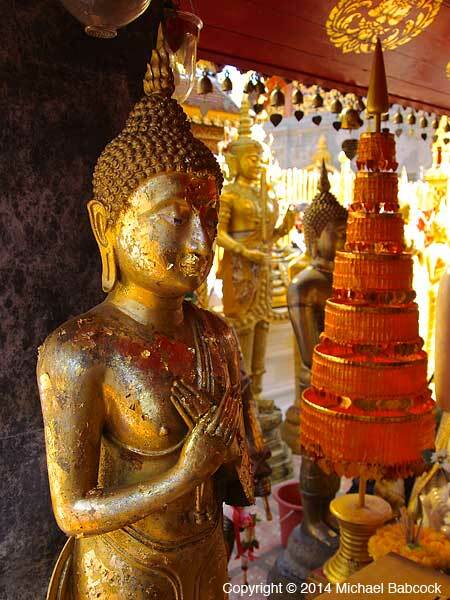 There is nearly always a stupa (called chedi in Thai) and a building with the main Buddha image. 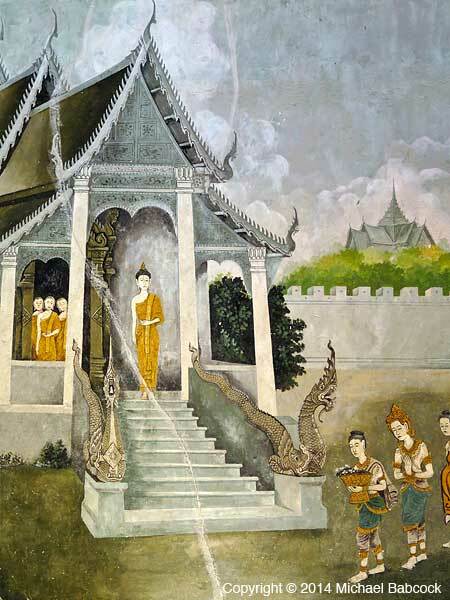 The main feature of Doi Suthep is a large chedi in an inner courtyard; a sala around the courtyard contains temple murals and many Buddha statues. 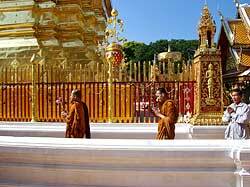 In-between the chedi and the sala is an area with many “chapels.” One of the customs at Doi Suthep (indeed, at many temples) is to walk around the main chedi 3 times in a clockwise direction. 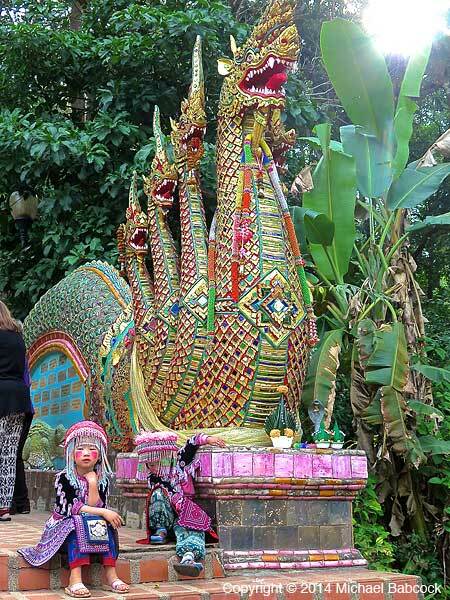 Outside the chedi area are many more statues and various buildings. 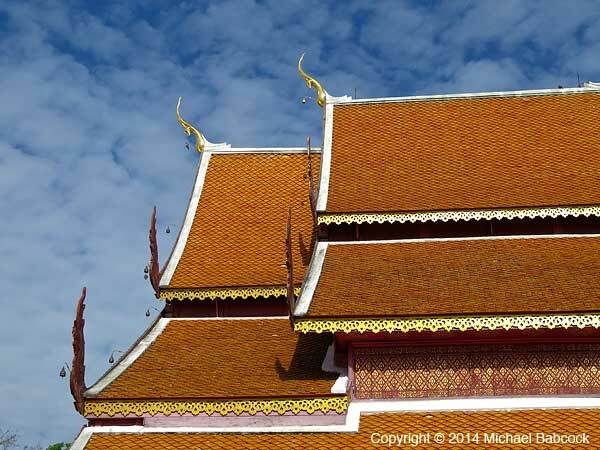 I love photographing temples in Thailand. Everywhere you look there are arresting visual images and details that are easy to overlook if you focus on seeing just the main attractions. 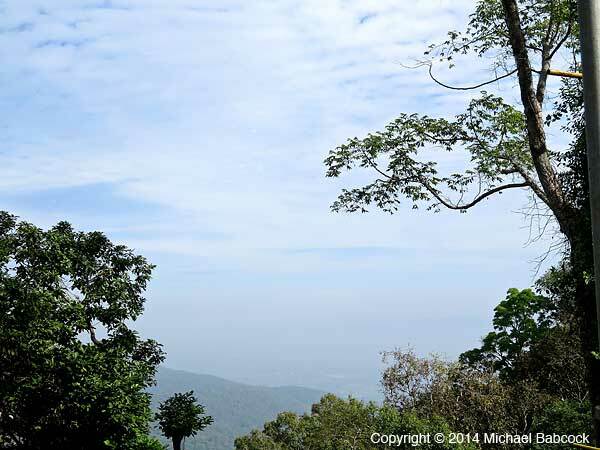 Doi Suthep is particularly rich in photogenic features. I’ve been there many times and each time it is varied and different. This photo essay represents this year only. Since one picture is allegedly worth 1,000 words, here is my “29,000 word” blog, each picture accompanied by a minimum of words to provide context. You may want to walk through the photos by clicking on each image so that you can have time to read the accompanying text. Give time for the slides to load. Please enjoy. 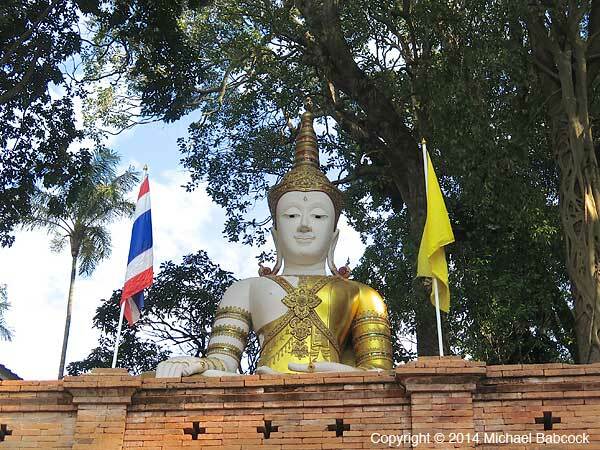 Doi Suthep is on a hill; this is the first Buddha image you see as you arrive at the base of the hill. 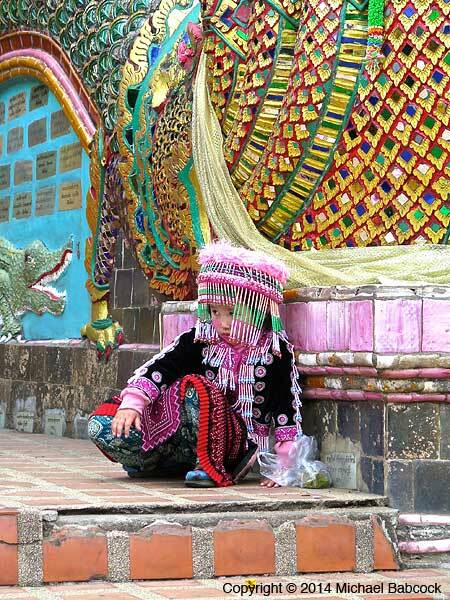 Passing shops, you come to the base of the stairs, where these Lisu girls wait to be photographed (for a fee). 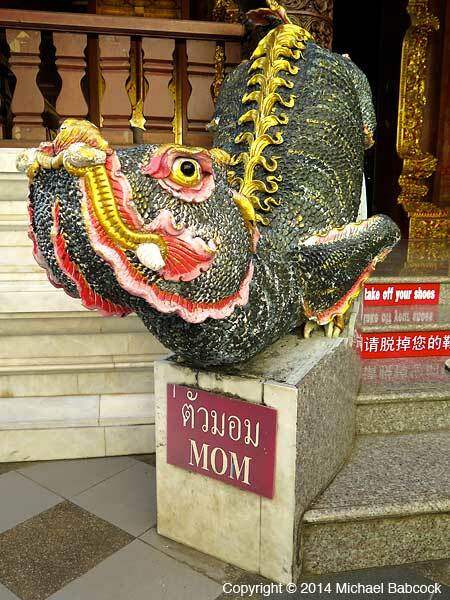 The Naga (mythical dragon) protects the stairs. Being photographed can be boring work. 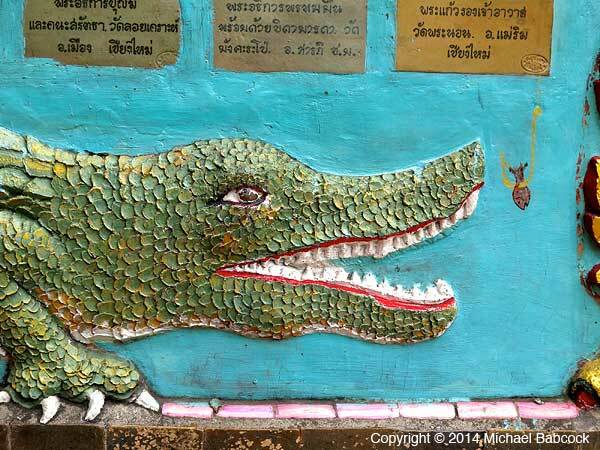 The lower staircase has some interesting details, such as this crocodile. Another detail at the bottom of the stairs. 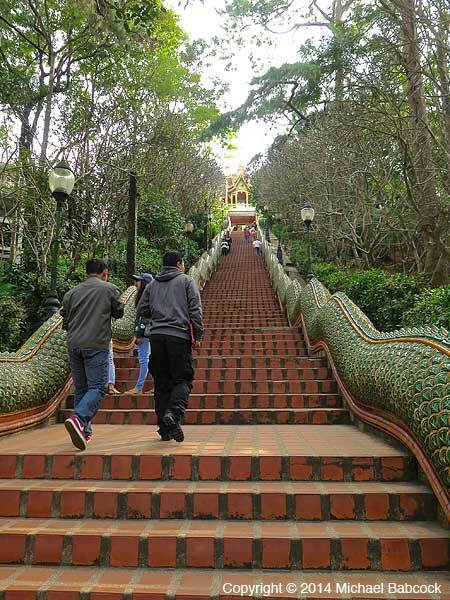 The stairs to the temple, with over 300 steps; a tram is available. One of two giants who guard the top of the staircase. The main chedi against a cloudy sky. 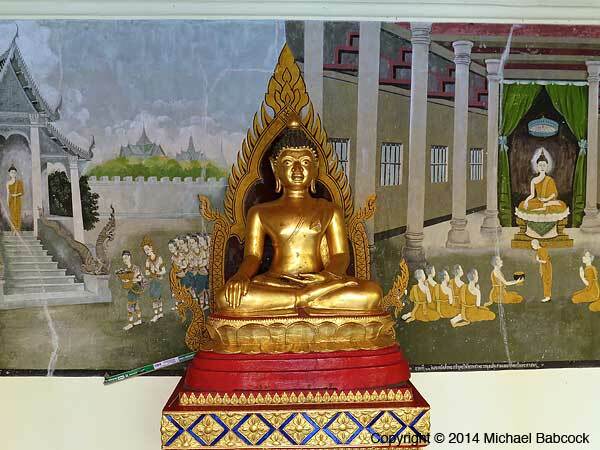 A Buddha in the inner courtyard surrounding the chedi, with murals on the wall in back. 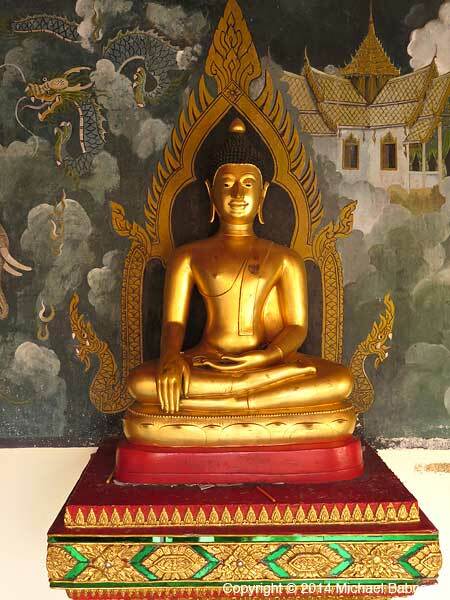 Another Buddha statue: the inner courtyard is lined with different Buddhas and murals. 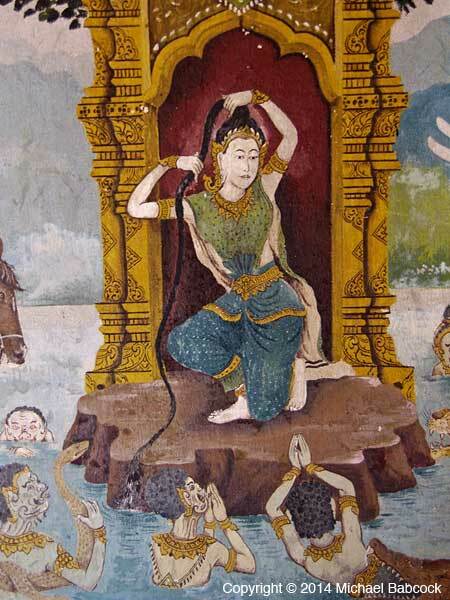 One of the temple murals. 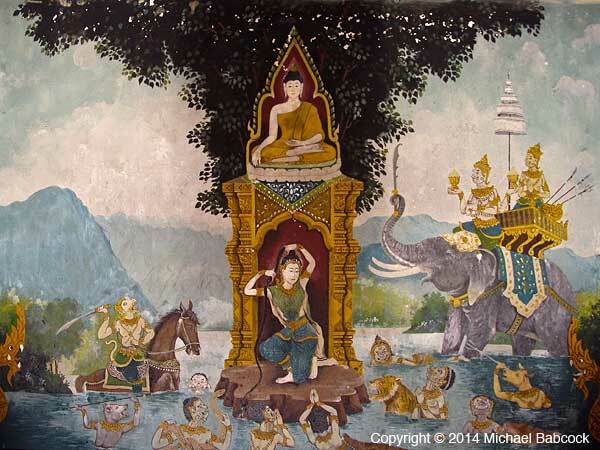 A mural of the Buddha's Enlightenment as witnessed by the Earth Mother Goddess. Close-up of the Earth Mother Goddess. The roofs of one of the buildings on the compound. 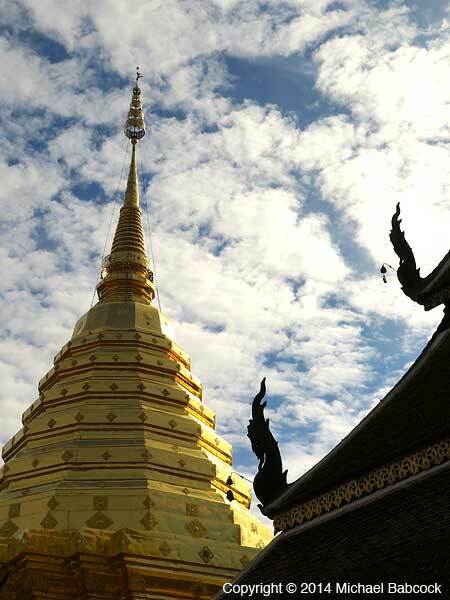 The main chedi is surrounded by many chapels, such as this one. 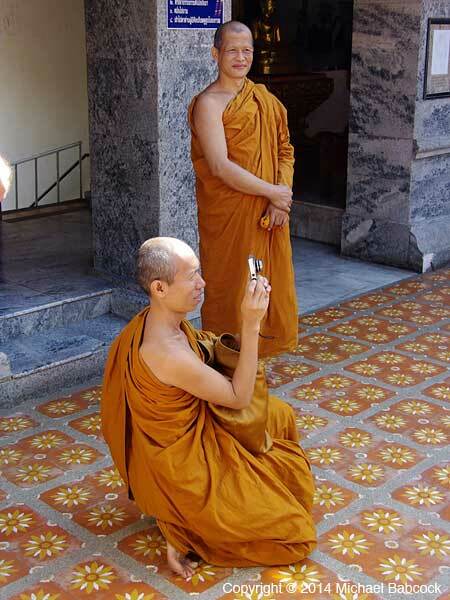 Monks with the "9th pre-requisite" - a digital camera. Many people, including monks, walk around the main chedi 3 times (once for the Buddha, once for the Dhamma and once for the Sangha). The author of this blog. Photo by his wife, Kasma. 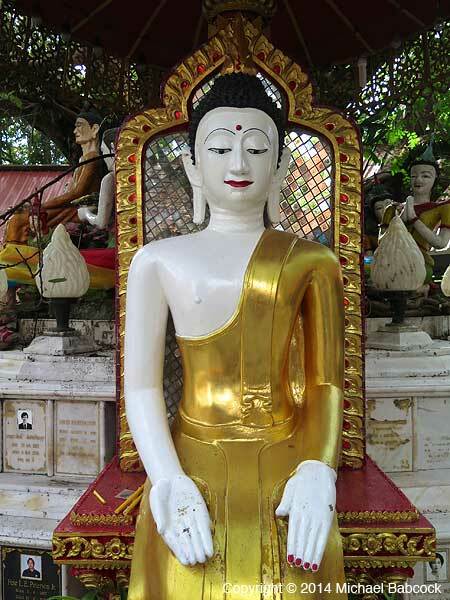 This statue is found in the area outside the main chedi area. 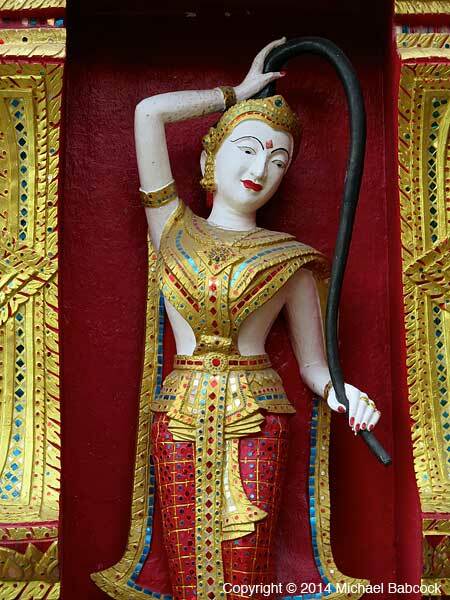 A statue of the Earth Mother Goddess in the area outside the main chedi area. A view from outside the main chedi. 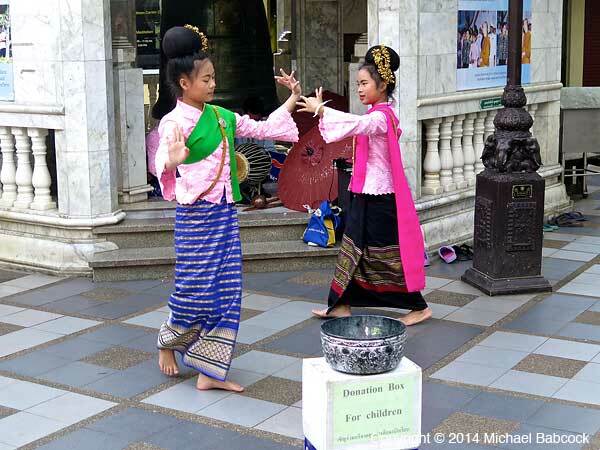 Two young Thai dancers in the area leading to the main chedi - there are usually entertainers there. 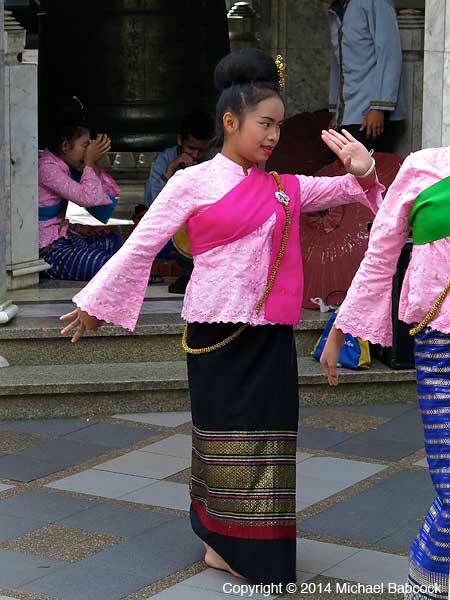 Close-up of one of the Thai dancers. 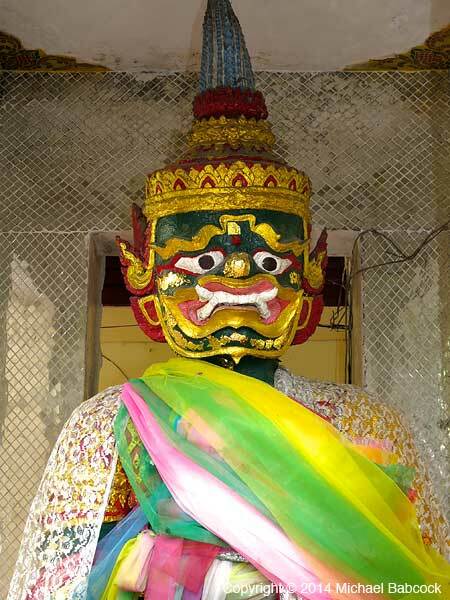 A guardian statue at a staircase outside the main chedi. 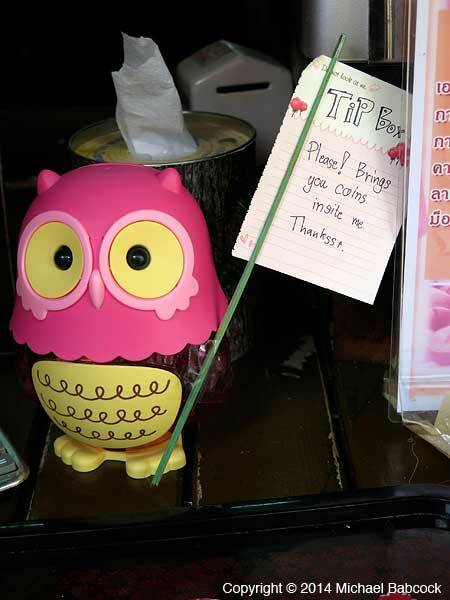 Solicitation for tips at a coffee shop at the top of the stairs. 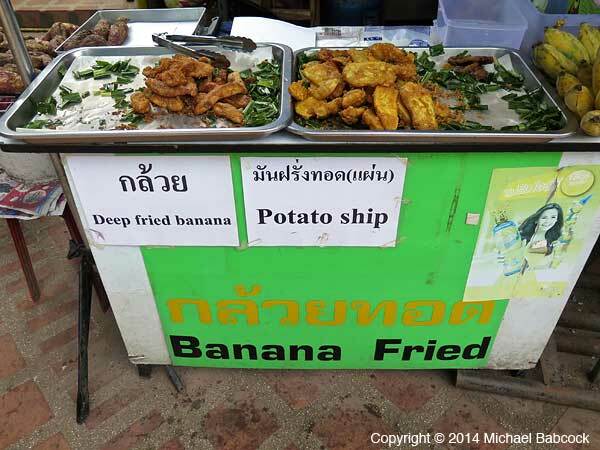 Fried food for sale at the bottom of the staircase on the way out; that area is lined with shops. 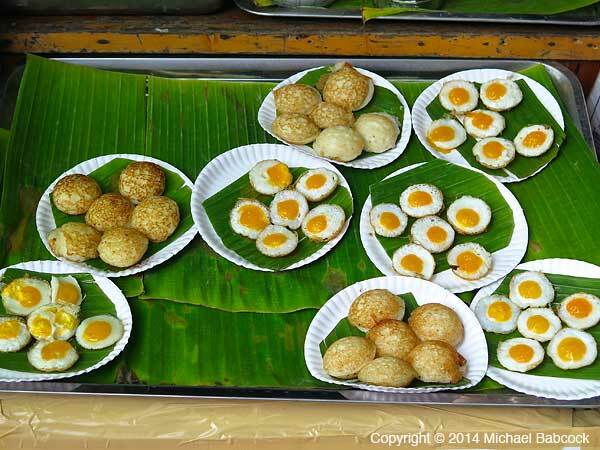 Fried quail eggs at the bottom of the stairs. Delicious! 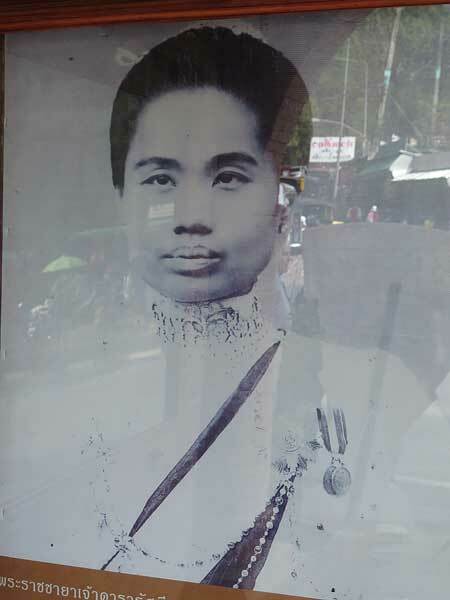 A photograph of Chao Dararasmi, Princess Consort of the Fifth Reign, one of many old photographs at the bottom of the stairs off the road. 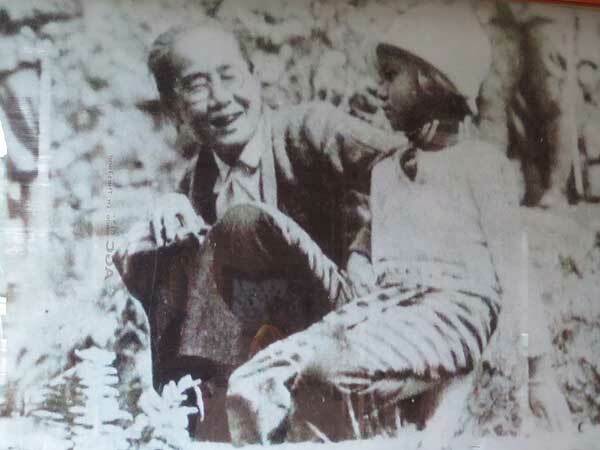 Chao Dararasmi and her niece, a photo at the bottom of the stairs off the road. We'll end with the first image. 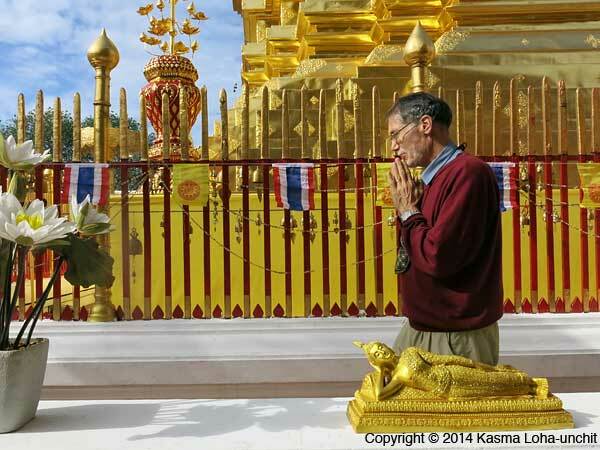 This entry was posted on Friday, February 20th, 2015 at 12:15 am	and is filed under Buddhism, Travel. You can follow any responses to this entry through the RSS 2.0 feed. You can leave a response, or trackback from your own site.